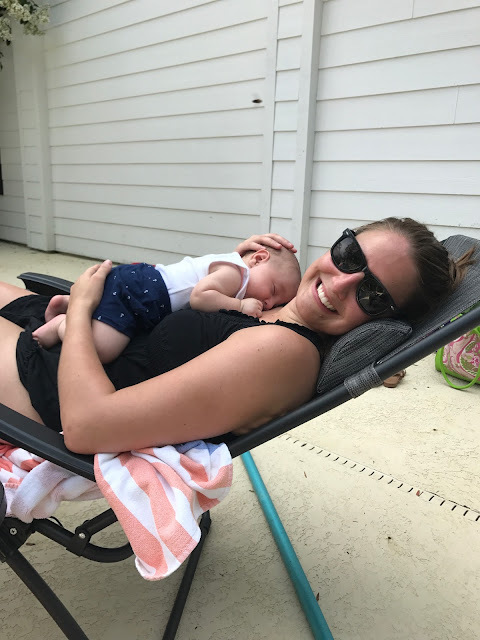 What an amazing month June was! We really kicked it off with a bang in New York, and it took almost all month to get back to normal, especially with a second weekend spent in Jacksonville. To resume normalcy, we tried to keep things low key for the rest of the month. As I was putting together this highlight reel, I realized I really stunk at taking pictures this month! I have almost no pictures from our Jacksonville weekend, and we did a few other things with friends this month that I have no record of. I'm making it a goal to be better about that in July! 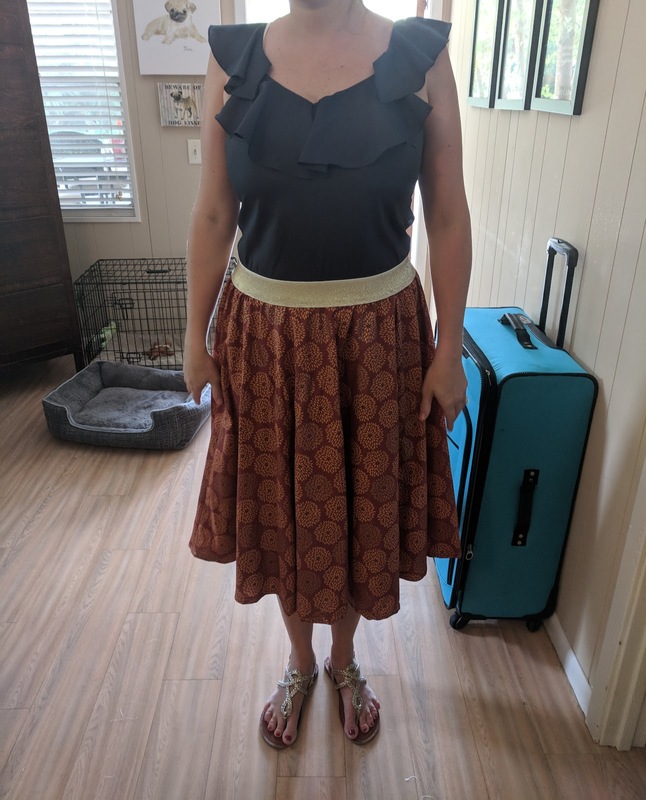 This is my second attempt at sewing a skirt! You can see the first one in this post. This time we were making a true circle skirt. 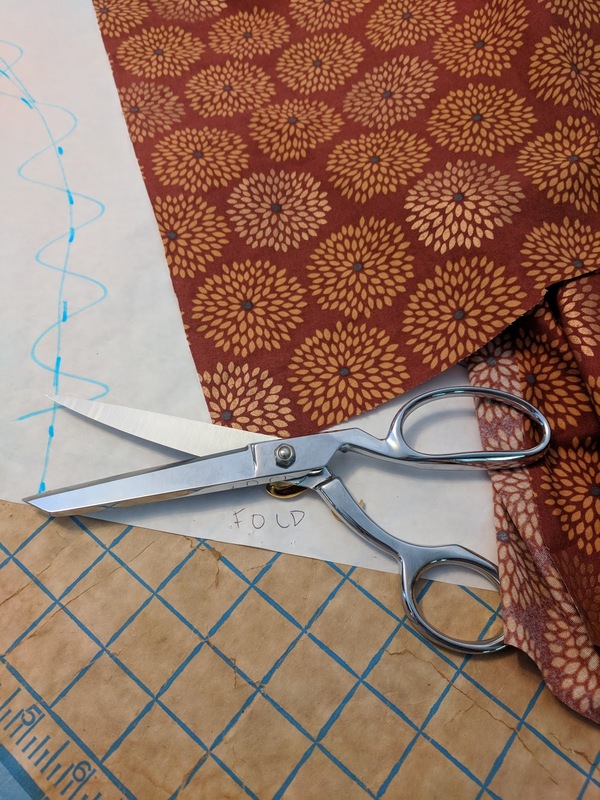 My mistake however was buying fabric that wasn't wide enough for this particular method, and so we had to piece it together. In doing so, we ended up with a skirt that is too big for me, haha! (I'm not so good at math, which makes me believe I will never be a good seamstress.) However! This skirt fit my sister perfectly! (She is in the picture below!) After she gets back to her pre-pregnancy size, she will give it back to me and I can re work it to make it fit me. But, it made me so happy that she could wear it for now. 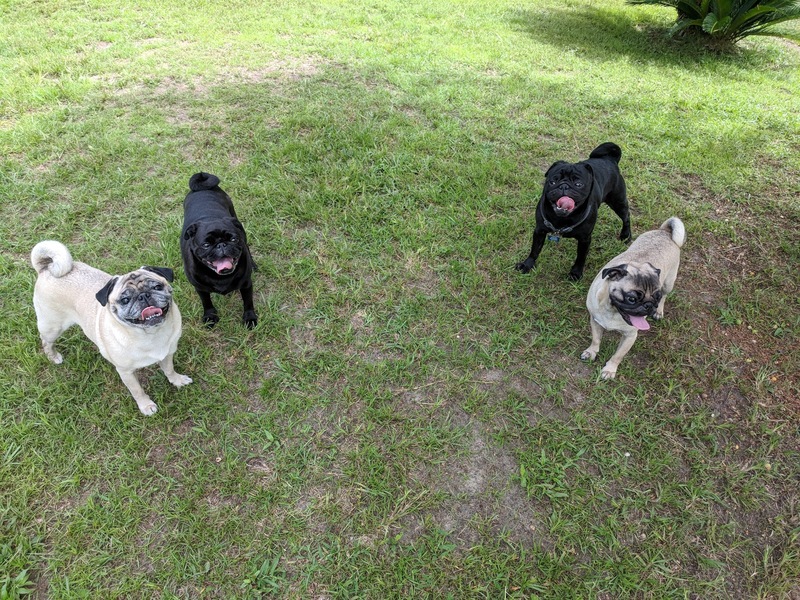 All Four Pugs In the House! We had a little puggy reunion with Fred this month. Winston was happy to have his brother around! He usually pesters his momma to death, so I know she was relieved for him to have Fred to tussle with for the weekend. The Pugs page gives a little background on each of our pugs, but in short when we rescued Bailey 2 years ago (2 years exactly today actually!) she was pregnant. Fred and Winston are her puppies! We kept Winston, because how can you not, and Fred lives with our cousins! 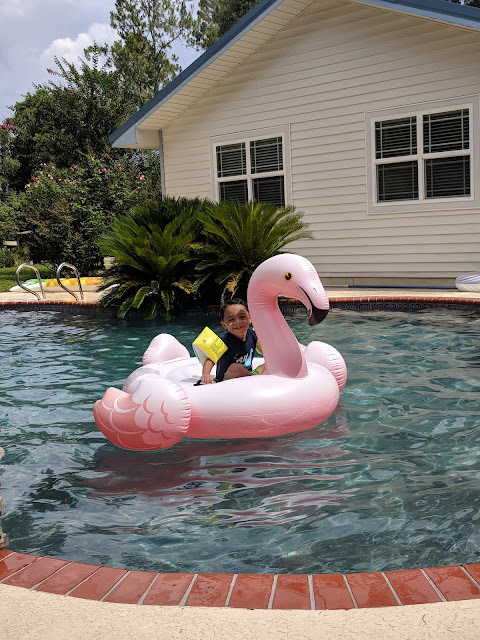 Thank goodness for friends with pools! We have had some seriously hot days this summer. My sister and I went to the pool one afternoon and it was so nice. Not very relaxing though, as we had to keep our eye on Carter! I have to try really hard not to wear sunglasses next time because I have a funny tan line on the top of my nose. After our trip to New York and a weekend in Jacksonville, I was SO sick of eating out at restaurants and craved some home cooking! Since then we've been really good about eating at home. 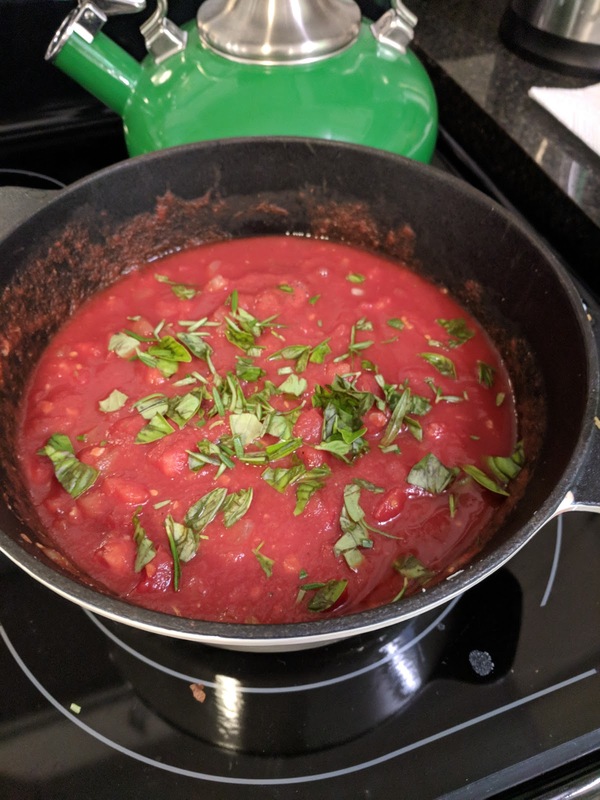 I made up another big batch of my favorite pasta sauce with tomatoes from my garden. 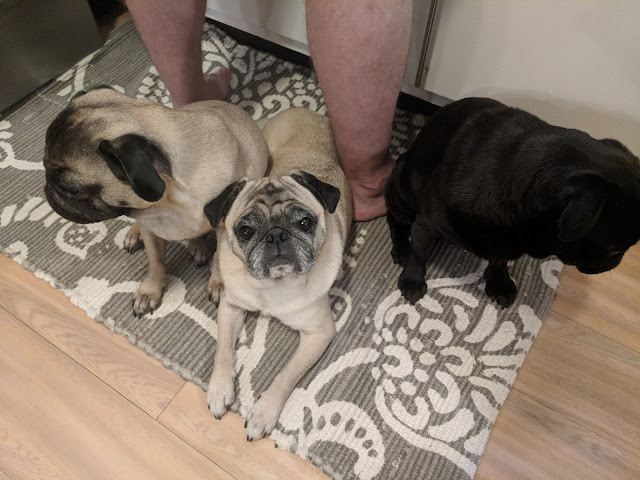 The pugs are always under foot when we are in the kitchen...just in case something drops! This is hands down the most relaxing part of my day! 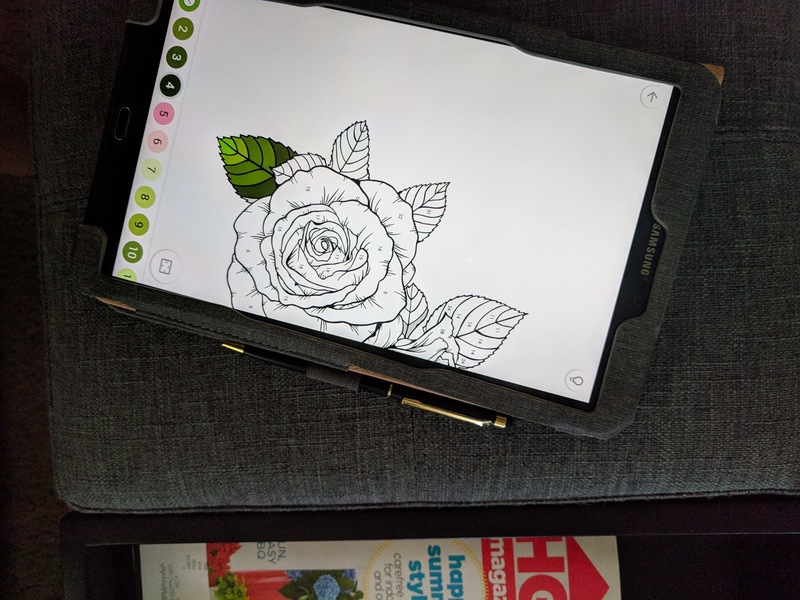 After a friend's kid showed me how much they love their paint by number app, I had to download one! It's the same concept as actual paint by number, it's just digital. It's so satisfying to watch the replay when you are finished! The app I linked is the one I'm using. It's great, there are just tons of ads! I went ahead and paid to have them disabled. Totally worth it. We really enjoyed this salad from Foodie Crush! Blake and I love to eat salads in the summer. This was was delicious, and fairly quick to make. 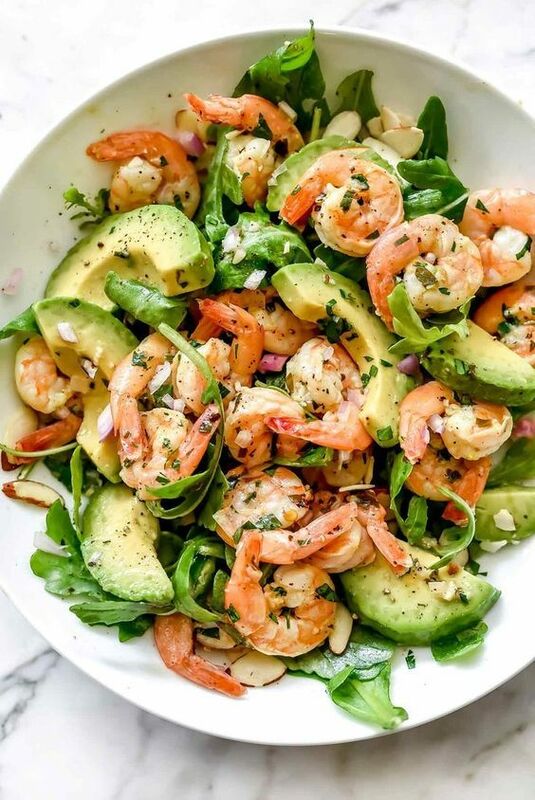 You'll have to click through to another blog for the shrimp recipe-but it's worth it. I added a little feta cheese as well. One easy way to refresh your phone is by changing up the wallpaper. I discovered that Erin Condren has a bunch of free wallpapers you can download. Such cute prints! I haven't tried the downloadable greeting cards but, I'm going to try those out next! I swear I'm not obsessed with EC, but I do love their designs. My planner has helped my productivity so much! 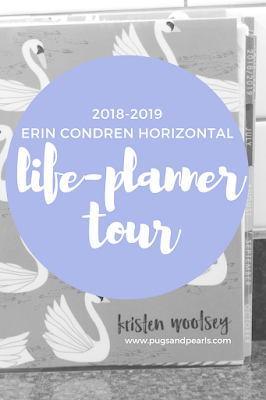 I shared my planner tour earlier this month-and the giveaway ends tomorrow! So make sure to enter!! DIY Fruit and Veggie Cleaner! Think about the journey your produce takes before it gets to you. Fruits and veggies get dropped on the floor, squeezed by random people, rolled down the checkout conveyor belt, and then touched again by the cashier. And that's all after it's been put on the shelf! I'm not a germaphobe by any means, but it does a world of good to clean our produce before we eat it! One of my favorite reasons is to save money! Clean produce lasts longer, and you are also more likely to eat it if it's clean and easy to grab. I find it easiest to clean all of my produce right after I get back from the grocery store. I promise it takes less than 10 minutes from start to finish! When I unload my groceries, I put all the produce that I want to clean out on the counter. I clean almost everything. I don't bother with bananas, because the peel obviously gets discarded. I do, however, wash things with skin that I plan to cut through. The knife can take the dirt/germs down with it into the fruit or vegetable. Check out the grime and wax on that apple! That's all going to be gone in just a few minutes. Let's make our spray! Shake, and spray! Leave on for 2 minutes and rinse with water. 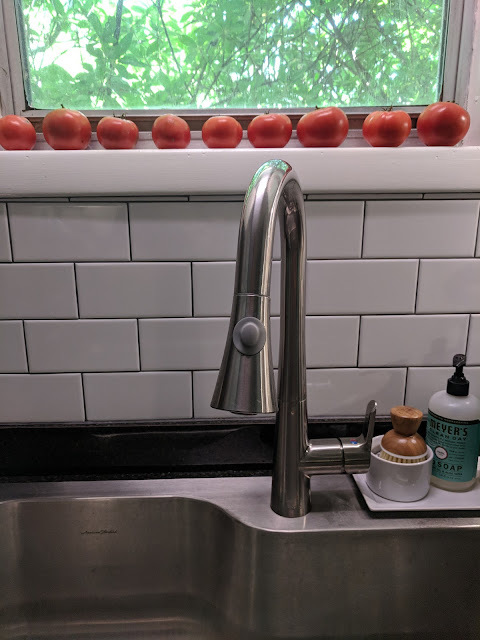 I like to spray over the sink, and have my fruit hang out in a colander while it soaks in. Leave the spray on for 2 minutes, or a little longer if really dirty. After you rinse, you are good to go! If a fruit is particularly waxy, you may need to rub it a little. My spray bottle is from Grove Collaborative! New members get a bunch of free stuff if you use my link to sign up for an account. Check out that before and after!! That is with ZERO scrubbing! This spray brings life back into your produce. It's all natural, so you can feel comfortable using it on your food. I leave my spray in the fridge and you can use it for several grocery trips. 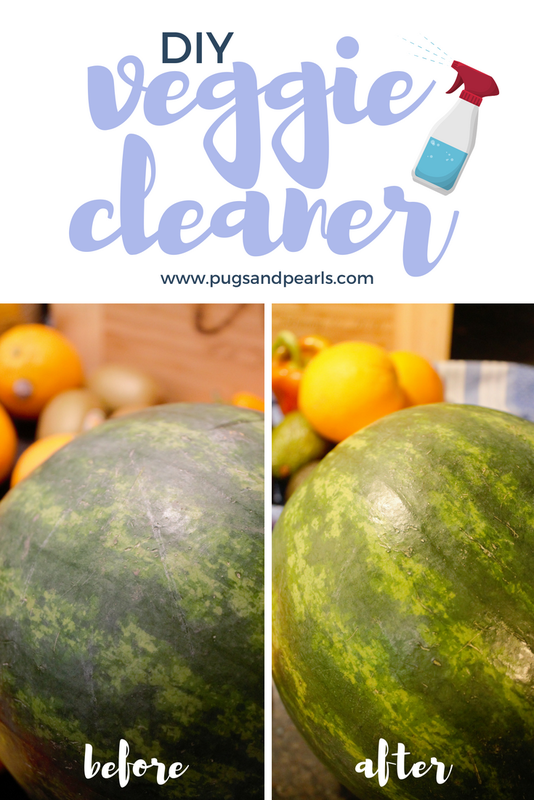 Leave a comment below if you love natural cleaners! Are you diligent about washing your produce, or are you relaxed about it? Since 2014 I've been sharing my planners here! 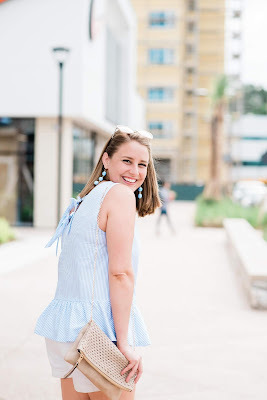 I've tried so many different brands of planners, from a Lilly Pulitzer agenda to the Emily Ley Simplified planner. Then last year I decided to switch to solely digital planning. Although I still 100% stand by that system, and will still be maintaining most of it, I did end up buying another planner this year. There was a shift for me this spring, and as I started juggling a few new responsibilities and jobs I just felt like I needed to start writing things down again. The main way Blake and I communicate with each other's schedule is our Google calendar. So, I will most definitely still be updating our events and family schedule. But, things like my blog, Etsy shop, work, volunteering and personal to-dos need to be written down. I think this is really going to help me keep things straight! Erin Condren planning people always seemed to be a little bit extreme to me. All of those stickers! It just seemed time consuming, and more of an art project than a planner. Another blogger recommended the EC notebooks so highly, and as a office supply junkie I had to try one! To say I love those notebooks is an understatement. The paper quality alone is wonderful, and who doesn't love a custom cover?? I was ordering a 3rd notebook when I saw the new release of the 2018-2019 planners. Out of curiosity I browsed the new designs, and of course I was smitten! As I mentioned, I was really feeling the need to begin paper planning again and the great designs sealed the deal. I already knew they'd be of great quality, but I was truly blown away! This is a great yearly overview, and with the clear dot stickers I can easily mark important dates! Fun fact: I keep a list of our friend's and family's anniversaries and try to send them a card each year. I decided to use this page to mark off those dates, so I can quickly glance and see how many cards I need to prepare each month! There are so many uses for this double sided pocket in the back! Right now I'm using it to store my sticker sheets. I can see it being so useful for keeping coupons or mail or really anything. My planner kit also came with a clear zip pouch that is flush with the planner. It's also really convenient to store slips of paper there. Most of the EC planners that I had seen were the vertical design, and those are the ones that are usually heavy on the stickers! The horizontal layout seemed right up my alley. It's got plenty of lined space to write out your daily schedule. What I most appreciate are the squares on the end of the day's box. 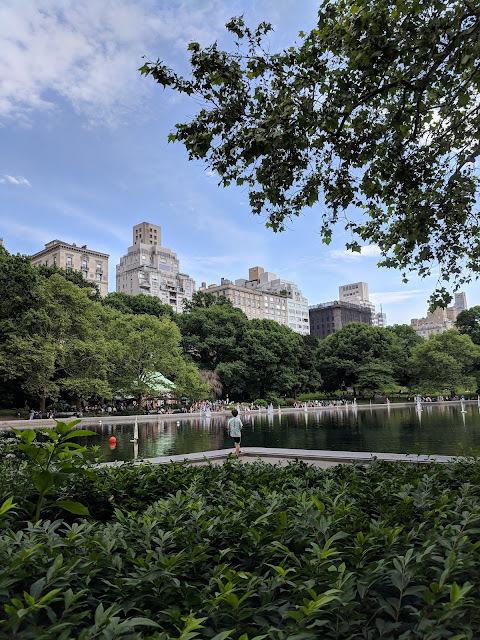 It's the perfect place to write your to-do list or a special event. I went through and used that box to write out bills that will be due that day and annual events. Customizing my planner cover was so fun! There are dozens of choices, and then you can customize colors after that. I was stuck between a couple, but I ended up with the Swans design. The color options are amazing-and I of course had to choose cornflower blue. On the last page of the month there is a fully lined page for notes. I decided the perfect use for this page would be a space to write down monthly highlights and gratitudes! I've already numbered each month so it will be easy to quickly jot down something I was grateful for each day. Alright, so I like the stickers! I really don't see the need to deck my whole planner out in stickers and washi tape-but a few stickers here and there are so cute! My planner came with 3 sheets of stickers, and I bought a few more sheets from Erin Condren as well. Their stickers are colorful and most of them have a really nice metallic accent. I have the travel sticker set, the budget sticker sheets and the transparent dots set. The real find, however, are the customizable stickers! You choose the color and what they say. I did two of these sheets for the events that happen all the time. One color is for vet appointments, another as a reminder to turn in my time, basically the things that are happening monthly that I don't want to write over and over again. Love these! The price is so good too. Additionally, I picked up a few sheets from Etsy! I adore these pug stickers, and I also really like these payday flags! I accidentally ordered too many of those pay day stickers, and I want to give them away to one of you! Plus a few other goodies. Make sure you enter in the Rafflecopter widget below! If you don't have an Erin Condren account yet, you can sign up using my link and a $10 gift certificate will be sent to your email! 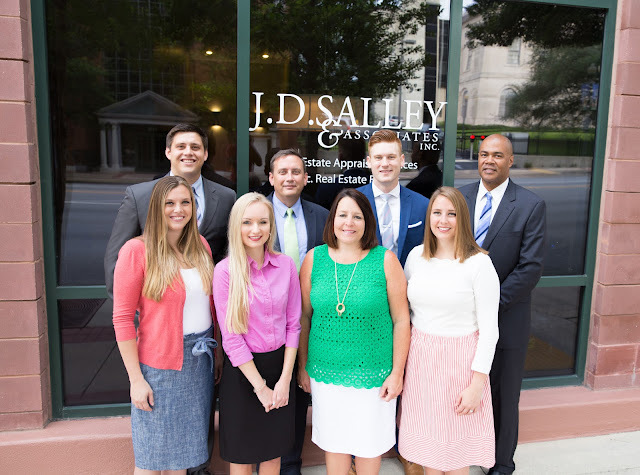 Don't forget to leave a comment below telling me your preferred planning method! Are you strictly digital, or do you like to write things down? 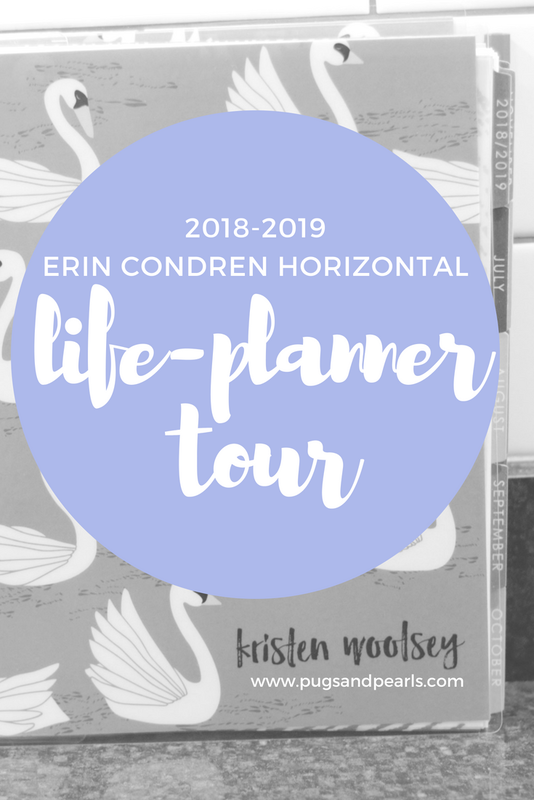 Tell me what planner you are currently using and if you've tried the Erin Condren LifePlanner! Stickers or no stickers? 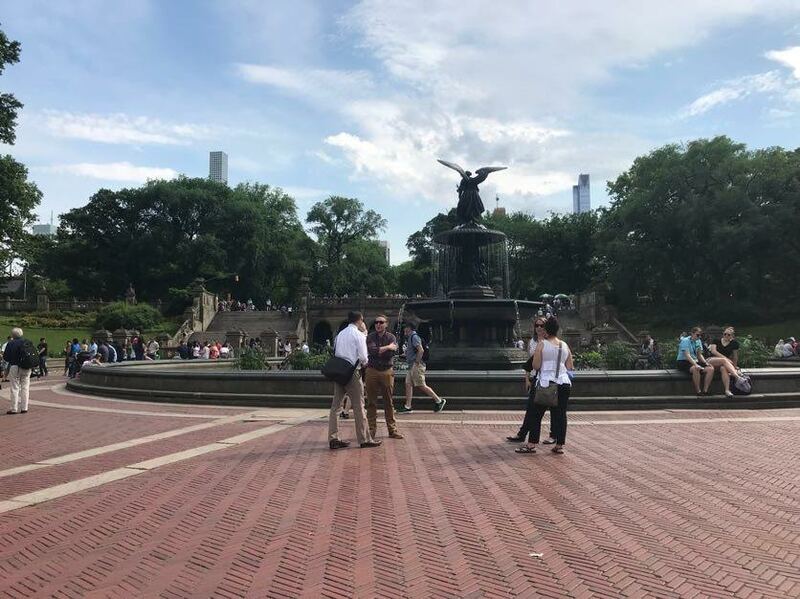 Scenes from New York City! Since I have well over 500 pictures of our recent trip to New York, I thought I'd share our first and last day in the city. Sandwiched between our days in NYC we spent time all around New York and New Jersey! 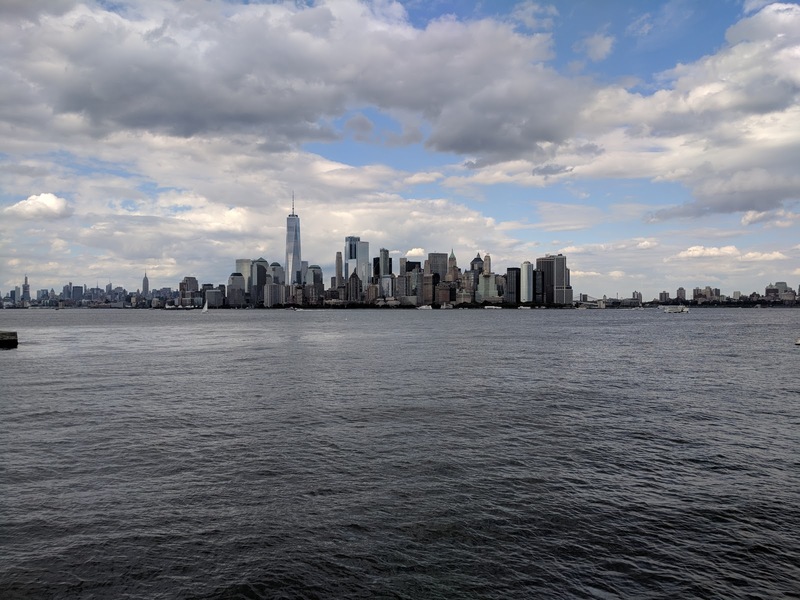 We arrived in New York City at 8 am after a 2 hour flight and an hour drive to the airport. (So yeah, we woke up at 2 am that day!) Determined to get the most of our day we popped into a cramped french bakery in Queens for breakfast and then we headed to Battery Park. We went with our good friends Laura and Damon and her girls Bradley and Callie. I swear, just watching those girls have a good time was enough for me! 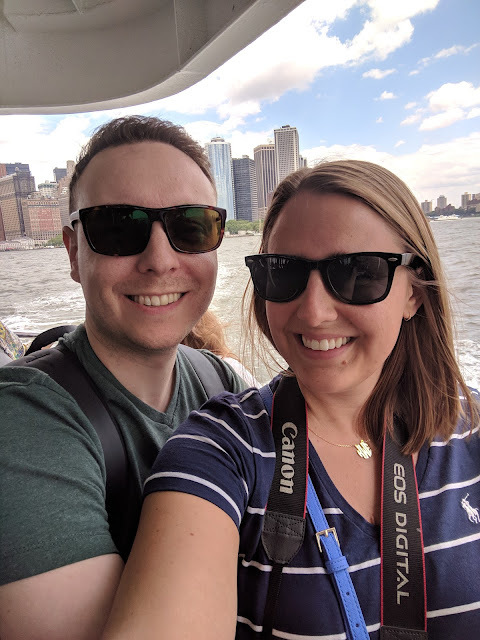 After exploring Battery Park, we took a ferry to see the Statue of Liberty and Ellis Island. There were SO many people! 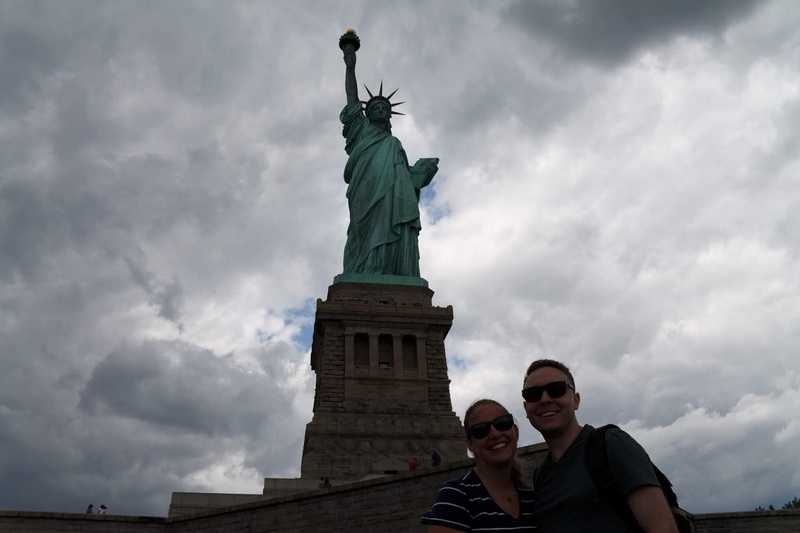 My favorite part, by far, was watching everyone try to get a good photo with the Statue of Liberty. People were laying on the ground and contorting their bodies every which way to get the shot! It was great. Ellis Island was very interesting! 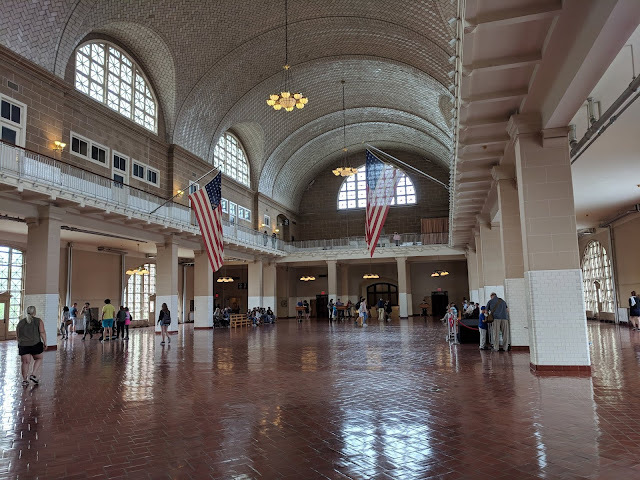 The building itself was fascinating, and the stories it had to tell were amazing. Life used to be very hard for people, and it really wasn't all that long ago. You do have to pay to research your own family. My mom let me know that our family didn't come to America through Ellis Island so I knew that ahead of time. One day I'd like to do a big research project about that! Callie has an extensive 'stuffie' collection, and when she tells you their names you'd better remember, because there will be a test! Since we were flying out of JFK we spent our last day in the city as well. 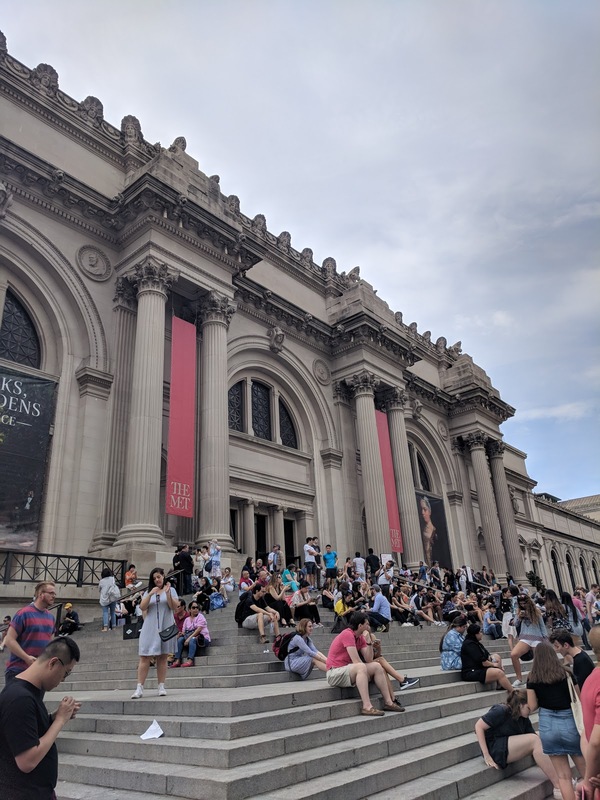 The majority of our day was spent at The MET! We did a tour, but I swear we only saw 5% of what that museum had to offer. You could get lost in there for days. 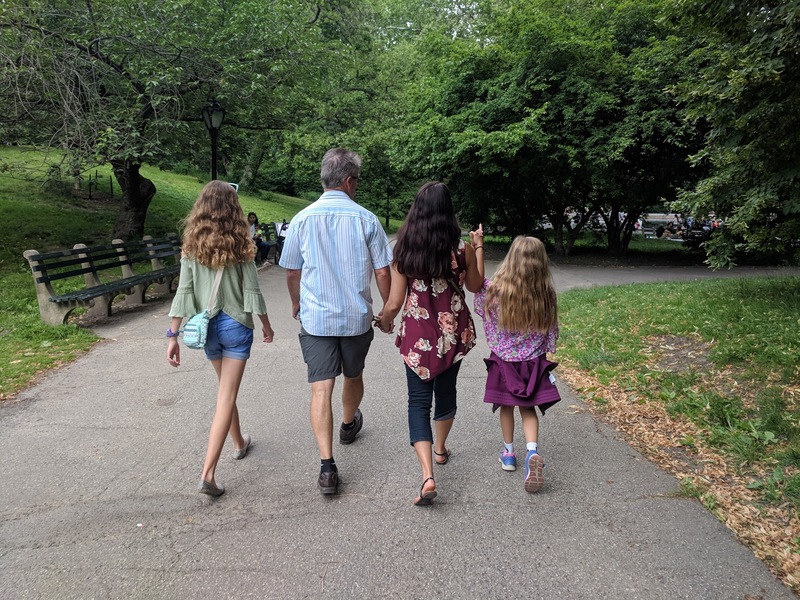 After our tour we walked through Central Park, which was something I'd never done. It's huge! People watching is one of my top ten favorite activities, so I fully enjoyed that aspect. 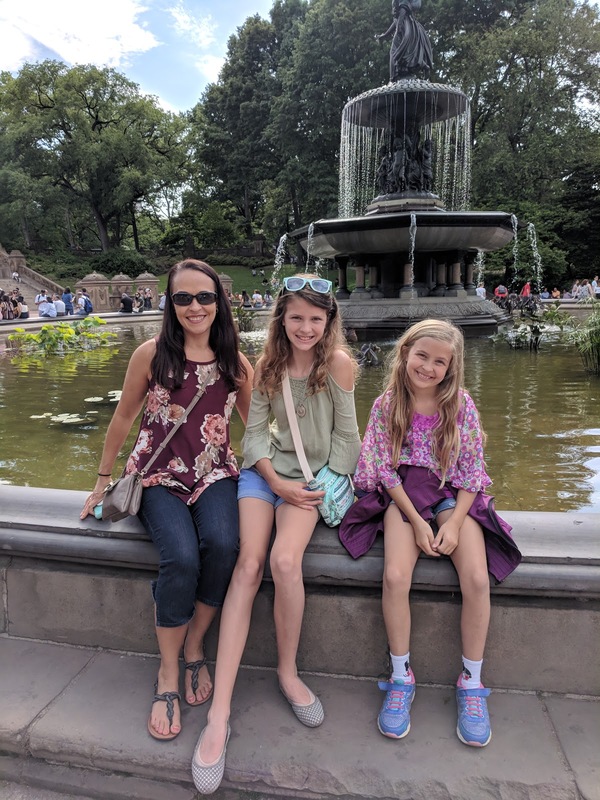 After a trip to Bethesda fountain and an ice cream cone, we had to get back to the airport. 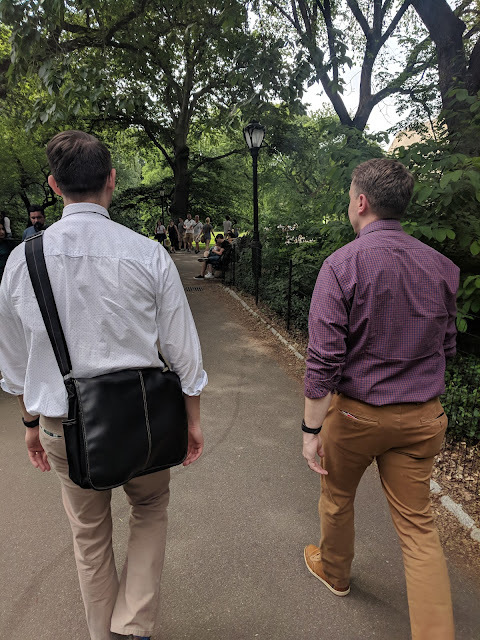 This last picture that Laura snapped is so funny to me, because it shows how badly we didn't want to leave our friends! We don't get to see each other nearly enough, and we always have so much to say! They are constantly trying to get us to move up there, and I think they had me almost convinced in this conversation. 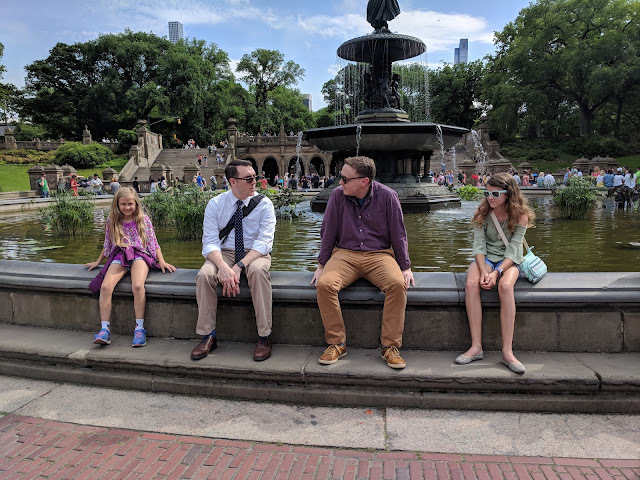 The thing is, we were there in June...but our last trip to NYC was in March, and it was the coldest I have ever been in my life. I'm a Florida girl...I really don't think I can live in that! Gosh, I have so much more to share, but I think I will leave it at that. Most importantly we left feeling refreshed and motivated! And we are still friends! Everyone has such a different traveling style, so it's awesome that everything worked out so well on this trip! My favorite thing by far was watching these girls take their first airplane ride. So much joy! I really wish adults still got excited like that. 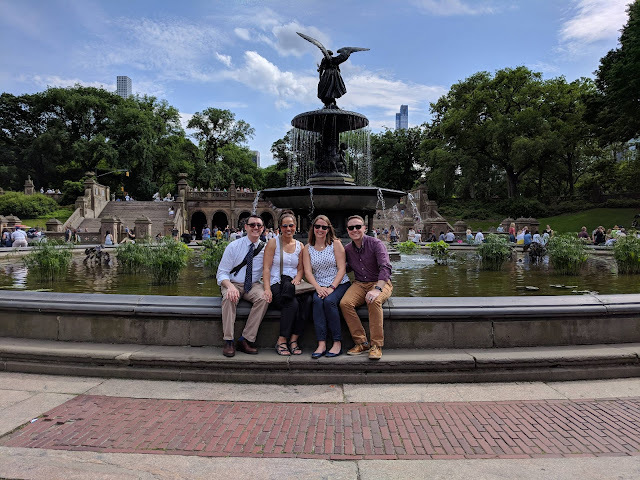 We've been planning this trip for at least a year, so I can't believe it's over. We had a great time, and really made the most of our days. And coming home to excited pugs was really nice too! 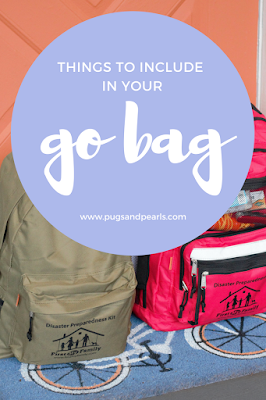 Things to Include in your GO BAG!